Recently, Chiara has been sleeping on the floor in our bedroom. She goes to sleep in her own room but at some point in the middle of the night comes into our bedroom, and in half sleep I tell her that with Luke, me and my growing belly, there’s just no room. So, she goes to the foot of the bed and lies down on the floor! Since she sleeps on the floor of her own bedroom most of the time, shunning her oh-so-comfortable bed, I don’t worry too much about it though I find the whole thing strange. But the last few nights she’s had nightmares. And honestly, I have to giggle. The one I remember most vividly is when she cried out: “I don’t want vanilla in my chocolate (milk — she uses the Korean word for it)! I don’t want vanilla in my chocolate milk!” Loud sobbing ensued. 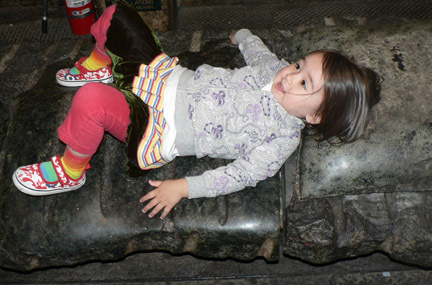 Chiara wearing an outfit entirely chosen by her, lying on a stone sculpture of a bed in Chelsea Market. Please note that she is wearing a hoodie over a t-shirt over a multi-striped dress over a green velvet skirt over red leggings with tie-dyed socks and flower-printed canvas mary janes. It was Mother’s Day Weekend for us as we celebrated on Saturday at our place with my brother and his family, and my mom, and then had a mothers’ brunch on a gorgeous Sunday with Luke’s mom, nana, my mom and Grandma Vitti, along with a bunch of non-mothers like luke, his sister monica, her dad Michael, her uncle and aunt Tom and Carrie and Chiara. Chiara made a beautiful gift of her handprint on a white tile. She managed to get both blue and purple handpaint and make a perfect impression of her little hand. Before I had seen this Mother’s Day gift, she had a conversation with a dad, Ed, at her music class in which she asked him what his favorite color was. He said blue and she said, My favorite color is blue and purple and white. But my big gift today was when I asked Chiara to pick out which shoes she would wear today and she said her pink jellies, or the plastic candy-colored sandals that have ankle straps. She said, I want to wear my jellies, but mommy, can you snap them? So I said, sure, I’ll snap them for you. 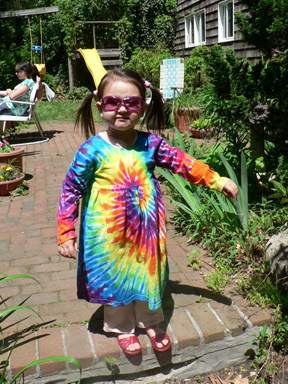 Grandma Mimi gave Chiara a tie-dyed dress today and in the gorgeous spring light, she looked as brilliant as a sunburst. You can see her jelly sandals on her feet!